Nestled among the National Library of Medicine’s renowned and wide-ranging History of Medicine collection of rare manuscripts, historic books, and journals is the third oldest Arabic medical manuscript in existence. The Comprehensive Book on Medicine (Kitab al-Hawi fi al-tibb), is the oldest manuscript in the collections of the NLM, and the anchor of the 139 items in the Persian Arabic collection. “It’s a rare, significant, and extremely old manuscript,” declares Michael North, who heads the History of Medicine Division’s Rare Books & Early Manuscripts Section. Copied in beautifully wrought script by a scribe somewhere in the Middle East in A.D. 1094, the manuscript, known simply as the Hawi, is still in superb condition after almost 1,000 years. 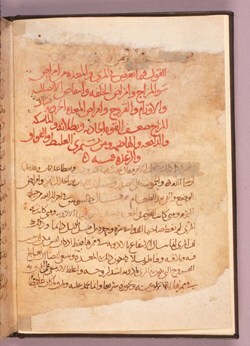 The Hawi is the work of one of the era’s great physicians, Abū Bakr Muhammad ibn Zakarīyā’ al-Rāzī, (c. 850-c. 925) known in the western world as Rhazes. As is common for Arabic texts of the period, the Hawi has no illustrations and was copied on paper—a technology unknown to Europeans of the time, who were still transcribing onto vellum (calf or goat skin prepared for writing). Born in the Persian city of Rayy, near present-day Tehran, Rhazes was one of the great practitioners of Islamic medicine of the Middle Ages. An intellectual giant, he was a physician, scientist, philosopher, musician—and alchemist. Before his death, in the city of his birth, Rhazes had revolutionized Islamic medicine, founded and headed hospitals in Rayy and Baghdad, and served as physician to the ruling Samanid dynasty (819-999) of Persia. His wide-ranging curiosity and habit of careful observation led him to distinguish smallpox from measles for the first time in medical history, an accomplishment cited by the World Health Organization (WHO), in 1970, which praised the originality and accuracy of his treatise. The Hawi is a notebook or journal kept by Rhazes over many years, full of his medical notations on diseases, therapies and treatments, as well as his interpretations of clinical cases, all arranged under headings for different diseases. After the death of Rhazes, his assistants and students collected his files—volumes of notes, readings, observations, and case histories into the Hawi, which today provides a glimpse into the life and work of a great medieval physician. The NLM copy is the oldest of the manuscript, though it is actually a partial manuscript containing only the section on digestive diseases and gastrointestinal complaints. As the scholar, Emilie Savage-Smith, PhD, notes, the Hawi remains one of the world’s important medical texts because of its insights, into Greek, Indian, and early Arabic medical writing. Rhazes credited all his sources, and while much of the medical writing that he refers to is now lost, his commentary is a valuable window into medieval medicine. You can learn more about Islamic medicine and science during the Middle Ages, and about the Library’s Islamic medical manuscript collection, at the Web site Islamic Medical Manuscripts at the National Library of Medicine. June 22, 2010 in Collections, Featured Articles.